Paris (24/10/2018) – Abdou Semmar, director of the online news site Algerie Part and correspondent of Internet Without Borders in Algeria was arrested on 28, October 2018 by National Gendarmerie of this Maghreb country. Abdou Semmar and his associate director and TV columnist Merouane Boudiab were arrested in the evening, and are still detained at the Bab Azzoun gendarmerie in Algiers. Internet Without Borders calls for their immediate release. Information website Algerie Part has revealed to the Algerian public many scandals related to bad governance and corruption of public officials in the country. Abdou Semmar is one of the spearheads of the battle to protect online press publishers in Algeria, advocating for the creation of a professional organization, and the recognition of their rights and freedoms. “Internet Without Borders is deeply concerned by the arrest of its correspondent in Algeria. Abdou Semmar’s work for the emergence and recognition of a professional online press in Algeria has been systematically deterred by the authorities for more than 2 years. We call for the immediate and unconditional release of our correspondent, and his associate director, whose only wrong is to do their job, journalism”, said Julie Owono, executive director of Internet Without Borders. 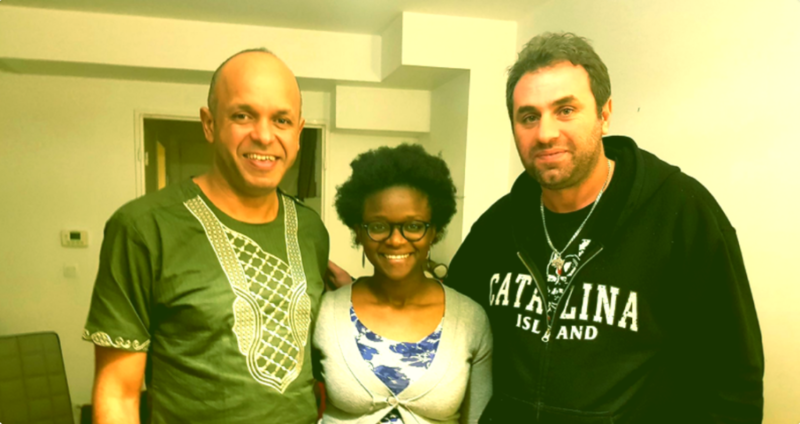 (Paris, 18, October 2018 – Abdou Semmar, with Julie Owono exec. director of nternet Without Borders, and Archippe Yepmou, President. During his last visit to Paris, Abdou Semmar told Internet Without Borders about the daily pressures and harassment that he and his teams have been enduring for several months. He also alerted on the possible upcoming arrests of online journalists by the Algerian police. His arrest as well as those of other online journalists give reason to his gloomy premonitions. On 22, October 2018, the day before Abdou Semmar’s arrest, Adlene Mellah, publisher of the Dzairpresse website, was also arrested and questioned by the gendarmerie services in Oran. For Internet Without Borders, this arrest is part of the current and concerted pressure of Algerian authorities against online journalism.